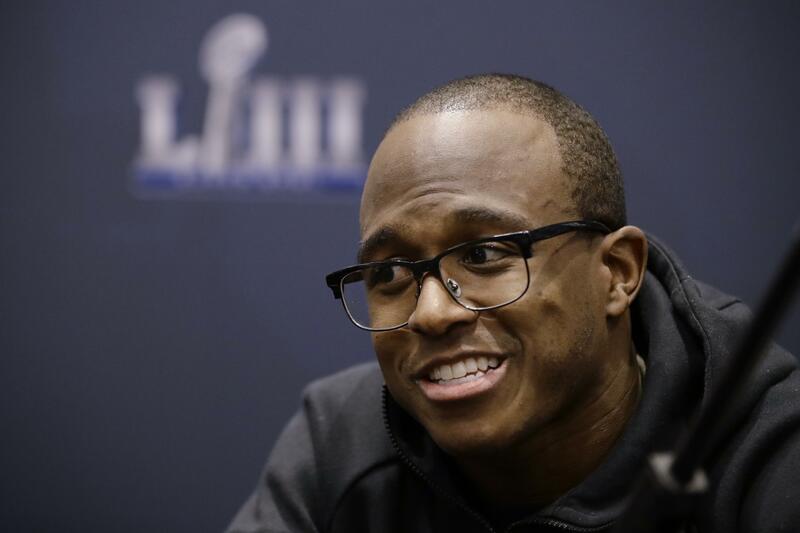 ATLANTA – Matthew Slater is more than halfway to his father’s longevity as an NFL player. He doesn’t plan to equal it. The star special teamer of the New England Patriots just completed his 11th pro season, and he’s at his fifth Super Bowl, with two wins. In his dad Jackie’s 20-season NFL career, he made one Super Bowl – coincidentally, with the Rams in 1980 – and lost to Pittsburgh. Not bad for someone whose Hall of Fame father didn’t necessarily want Matthew to play football. “He felt that way for two reasons,” Matthew Slater says. “First, he didn’t want me to feel the pressure of living up to his name. He thought the expectations could be unfair. “Sports have always been a big part of my life and have so many life lessons from being on a team, and the disciplines of preparing to compete and how you compete, and having teammates around you. I thought they were good lessons to learn,” Jackie Slater said. Matthew kept improving in high school and grew, though not to Jackie’s offensive tackle measurements. Because Jackie was unfamiliar with the kind of skills his son possessed, he turned to teammates Ron Brown – a 1984 Olympic champion speedster, who played wideout and returned kicks – and outstanding cornerback LeRoy Irvin. Brown refined Matthew’s technique and speed, and Irvin worked with him on back-pedaling and breaks for receivers. “Things I was not familiar with,” says Jackie, who recalled watching Matthew leave everyone behind in a 100-meter race, only to have Brown say “he did everything wrong. “He made every effort to be present,” the son says. “That’s what I appreciate the most: He was a father first. So many young kids … many black kids … I see they don’t have a presence like that. For sure. But on Sunday, well, Jackie admits to being a bit torn when the Rams – his team – take on the Patriots – Matthew’s team. “This is a win-win situation for me,” the elder Slater notes. “If my son loses, it’s not as if he hasn’t experienced the thrill of victory in a Super Bowl, something I never did. And if he loses, it hurts, but he has a great attitude about it. It helps me live with the defeats he has. “If the Rams win, I will be happy because I have been pulling for this team for more than 40 years. My first hero in the game was Tom Mack, who I actually played with for three years. Published: Jan. 29, 2019, 1:50 p.m.